Here are some examples of our current research projects. If you are interested in one of the topics please contact us by email for further detailed information and check out our publications page where you can find papers, software, and additional download material. 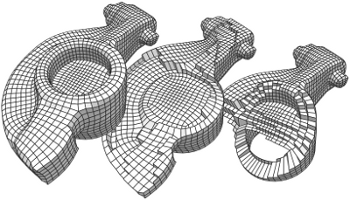 Remeshing algorithms are fundamental for the generation of high-quality CAD models in rapid prototyping, reverse engineering and conceptual design. 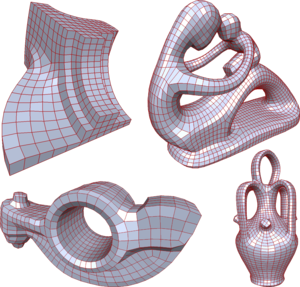 Traditionally, remeshing algorithms where focused on improving the local mesh characteristics, i.e., on generating mesh elements with optimal shape and regularity (nearly quadratic). Recently the focus has widened to also incorporate structural considerations, i.e. the alignment of the elements to mesh features like edges and corners. We propose a two-step approach: In a first step the model is segmented into a set of (almost) planar regions that capture the overall structure of the model. In the second step, these regions are remeshed while taking consisteny constraints along their abutting boundaries into account. This way we obtain a high-quality, quad-dominant remesh that properly reflects the features of the input model.